I have to spend a lot of money on Amazon Japan – sometimes I remember to write down my better discoveries, so that other researchers don’t have to take pot luck with cripplingly expensive postage. 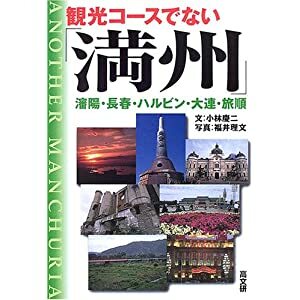 Manchuria Off the Tourist Track, by Keiji Kobayashi is a marvellous idea – a travel guide to Manchuria that highlights the region’s past as a Japanese puppet state. Kobayashi mooches about the modern-day Chinese provinces of Heilongjiang and Jilin, poking around odd monuments, and old buildings that are leftovers from the days when Manchuria was Japan’s own little exercise in imperialist expansion. This is where Mannerheim led a cavalry charge through the city centre of Mukden, against Japanese gunners, although Kobayashi also has time for the obscurer historical individuals, such as the grave of Verda Majo (1912-1947), the Japanese revolutionary who wrote books in Esperanto arguing for the freedom of China. Some relics are long gone. The Japanese who remained behind have largely faded into the local population, and three generations of Chinese history have added their own artefacts. Shenyang train station is still there, but the nearby memorial to the fallen of the Russo-Japanese War has now been replaced by one of the ubiquitous statues of Chairman Mao. Kobayashi, ably aided by his photographer Ribun Fukui, chronicles the ghosts of Manchuria’s Japanese past, including the brutalist monuments to Japanese aggression, and carefully preserved sites of Japanese atrocities, some of the skeletons left in piles where they were found. Manchuria is such a fascinating place, and includes the former capital of the Manchu dynastic founder Nurhachi; the great monumental tower built by General Nogi and Admiral Togo to honour their fallen men; Harbin, a Russian city on Chinese territory. They even dig up the old Man’ei Studios, once the largest film studio in Asia, that cranked out films in Japanese for the local population, now largely forgotten in film archives. Once the “cockpit of Asia”, Manchuria is now far off the tourist trail, but seems like one of the most exciting places for anyone in search of a glimpse of yesterday’s tomorrow. It is a sci-fi future that failed, and all the more interesting for it.